As an entrepreneur, you're the CEO of your company. It's important to take time to learn how to work ON your business, not just in it. Join Pathway Women’s Business Center, Corner to Corner and The Hub for Urban Entrepreneurship as we present a panel of experts in the multiple fields. **Limited seating available and lunch is provided. ​Kwanzaa Nashville, The Hub for Urban Entrepreneurship (creator of Black Entrepreneurship Week), and ALKEBU-LAN IMAGES BOOKSTORE are excited to announce the 3rd Annual BLACK BUSINESS EXPO during the 4th night of Kwanzaa (Ujamaa)! We will Celebrate our BLACK ENTREPRENEURS in Nashville, TN at our UJAMAA BLACK BUSINESS EXPO. Proceeds from Vendor fees will benefit Nashville's Youth About Business. To register as a vendor, visit https://form.jotform.com/estesmee/ujamaaexpo. Direct questions to info@thehue.org or (615) 293-7349. The Hub for Urban Entrepreneurship (HUE) announces Black Entrepreneurship Week 2018, which coincides with Global Entrepreneurship Week. From November 12 - 18, HUE is leading the charge to bring recognition to the efforts of Black entrepreneurs. Hosted in Nashville, Black Entrepreneurship Week will consist of a series of events that educate and inform the community in accordance with the theme, "Empowering Black Entrepreneurs." We're excited to support the CEO Roundtable taking place at Pathway WBC (home of Pathway Lending) on Monday (March 12, 6-8pm). 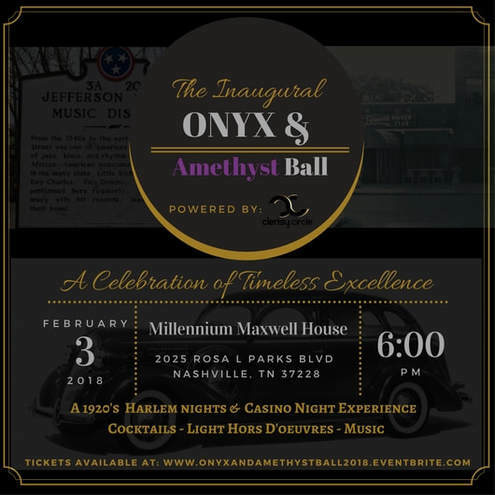 We are excited to announce our partnership with Clerisy Circle's inaugural Onyx & Amethyst Ball, sponsored by Nashville Electric Service and Prominence Holdings. A portion of the proceeds from this event will support The Hub for Urban Entrepreneurship programming in 2018, including the 3rd annual Black Entrepreneurship Week. To purchase event tickets, visit www.onyxandamethystball2018.eventbrite.com. ​For more information about the Clerisy Circle, visit www.clerisycircle.com or @clerisycircle on Facebook, Instagram and Twitter. On February 3, 2018, Clerisy Circle and Community Partners will fill the Millennium Maxwell House Hotel with 150+ influential leaders within the Nashville community to celebrate Black History Month, recognize the impact and contributions of African-Americans in Nashville, and highlight the importance of generational, race-based diversity. Designed to kick-off Black History Month and serve as a signature event, The Inaugural Onyx & Amethyst Ball: A Celebration of Timeless Excellence will celebrate the success of leaders, organizations, and corporations that positively impact African-American communities. This night of excellence will transform the atmosphere with a 1920's Harlem Renaissance vibe, live music by The Marcus J Band, cocktails, light hors-d'oeuvres, and include an exciting Casino Experience. 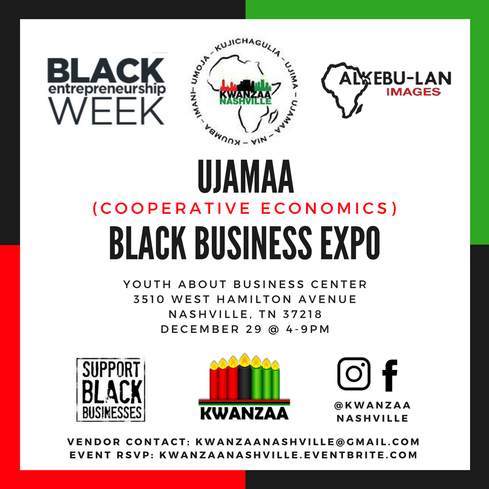 The Hub for Urban Entrepreneurship (creator of Black Entrepreneurship Week), Kwanzaa Nashville and ALKEBU-LAN IMAGES BOOKSTORE are excited to announce the 2nd Annual BLACK BUSINESS EXPO during the 4th night of Kwanzaa (Ujamaa)! We will Celebrate our BLACK ENTREPRENEURS in Nashville, TN at our UJAMAA BLACK BUSINESS EXPO. Proceeds from Vendor fees will benefit Nashville's Youth About Business. To register as a vendor, contact KwanzaaNashville@gmail.com to secure a space for your business. To attend, RSVP at www.kwanzaanashville.eventbrite.com. The Hub for Urban Entrepreneurship (HUE) is proud to announce Black Entrepreneurship Week 2017. From November 5 - 11, HUE is leading the charge to bring recognition to the efforts of Black entrepreneurs. Hosted in Nashville, Black Entrepreneurship Week will consist of a series of events that educate and inform the community in accordance with the theme, "Doing Business For Social Good." Back for the second installment of our Financial Empowerment Series, this time in South Nashville, Regions Bank is partnering with Clerisy Circle, Black Entrepreneurship Week, Knowledge Bank Nashville, The Equity Alliance, Urban Enterprise Group, and the Urban League Middle Tennessee to host a Financial Empowerment Series focused on teaching financial principles that put Nashvillians on a path to financial independence. The second of four community workshops will take place Tuesday, August 15 at Casa Azafran from 5:30 p.m. to 7 p.m. The event is free and open to the public. 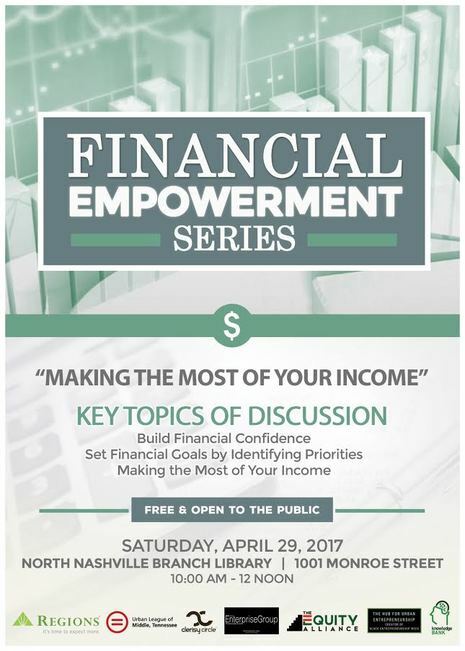 ​In celebration of Financial Literacy Month in April, come out to this informative community event focused on learning money principles that put you on a path to financial freedom. 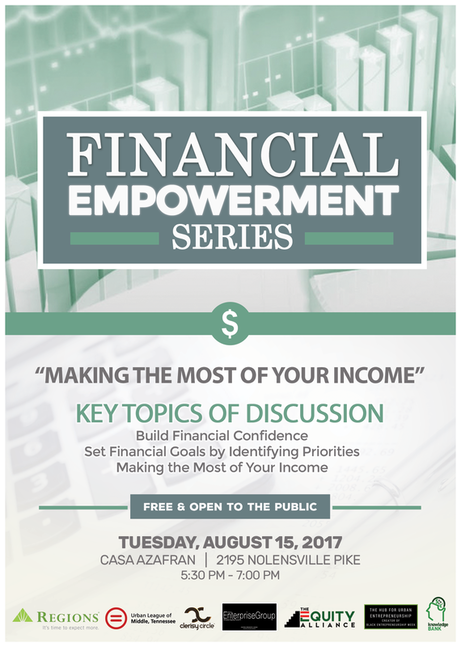 The Financial Empowerment Series is hosted in partnership with Regions Bank, Clerisy Circle, Black Entrepreneurship Week, Knowledge Bank Nashville, The Equity Alliance, Urban Enterprise Group, and the Urban League Middle Tennessee. The first of four community workshops will take place Saturday, April 29th at the North Nashville Branch Library from 10:00 a.m. to 12:00 p.m. The event is free and open to the public. The Hub for Urban Entrepreneurship (creator of Black Entrepreneurship Week), Kwanzaa Nashville and ALKEBU-LAN IMAGES BOOKSTORE are excited to announce the 1st Annual BLACK BUSINESS EXPO durning the 4th night of Kwanzaa (Ujamaa)! We will Celebrate our BLACK ENTREPRENEURS in Nashville, TN at our UJAMAA BLACK BUSINESS EXPO. Proceeds from Vendor fees will benefit Nashville's Youth About Business. To register as a vendor, contact KwanzaaNashville@gmail.com to secure a space for your business. To attend, RSVP at www.kwanzaanashville.eventbrite.com. RSVP in advance due to limited venue seating. *If your business is not listed, feel free to email gybnashville@gmail.com and/or complete the following form so that you can be added to The Blak List. On the second day of Black Entrepreneurship Week 2016, Conscious Conversation will host a panel discussion on The Legacy of Black Entrepreneurship. The purpose of this event is to highlight the past, present, and future of businesses in the Black community. LaDonna Boyd - Chief Operating Officer, R. H. Boyd Publishing Corp.
Roland Jones - President, World Solutions Inc.
To officially kickoff Black Entrepreneurship Week 2016, Clerisy Circle will host a fireside chat with author Maggie Anderson (Our Black Year) and the Empowerment Tour. The Hub for Urban Entrepreneurship, Inc. (HUE), a Nashville-based social enterprise, is proud to announce Black Entrepreneurship Week. Launched during the 2016 Global Entrepreneurship Week (November 14 - 20), HUE is leading the charge to bring recognition to the efforts of Black entrepreneurs. Starting in Nashville, Black Entrepreneurship Week consists of a series of events that highlight various aspects of Black business in urban communities across the United States.